What is blood pressure and how’s it measured? 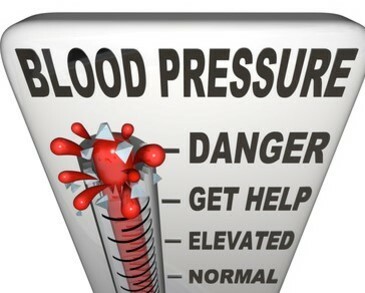 Blood pressure measures the pressure of the blood as it circulates around the body, in millimetres of mercury, mmHg. Two different measures are taken which are recorded like a fraction. In other words like this: x / y. Doesn’t that remind you of school?!? The top figure – the higher one – is known as the systolic pressure. It’s the force generated by the Heart as it contracts and sends blood round the body. The bottom figure – the lower one – is the diastolic pressure. This is the heart’s resting rate and occurs between beats as it refills with blood before its next beat. Traditionally, blood pressure is measured with a sphygmomanometer – an inflatable cuff that goes round the upper arm – and stethoscope. However, these days, there are easy to use cuffs that go round the wrist and can be used at home to check blood pressure. The figure you’ll most often hear is 120 / 80. In other words, a pressure of 120 when your Heart is contracting to force blood around the body; dropping to 80 when it’s resting as it fills up with blood before making the next beat. A reading of 140 / 90 or above is usually considered to be high; while one of 90 / 60 or below is seen as low. However, as always, these figures do need to be put in context rather than taken on face value. Blood pressure fluctuates quite naturally as we go about our lives AND there are many different things that can affect the readings without necessarily indicating a problem. More about this in a minute. Of particular concern is that these are only guidelines which have been developed by looking at large numbers of people to determine what is “normal”. While they may be useful as a general guide, it’s important that the health and lifestyle of each person is also looked at to determine whether it’s an issue for them. It often comes as a surprise to people to hear that their blood pressure fluctuates quite naturally during the day. But, when you stop to think about it, this makes complete sense. Like many other body functions, blood pressure is affected by our natural – circadian – rhythms. At night, when we’re asleep, our breathing and blood pressure drop although they do fluctuate a bit as we go through different cycles of sleep. As morning – and dawn – approaches they both start to increase ready for the day ahead. Once we’re up and about, our breathing, heart rate and blood pressure fluctuate depending on what we’re doing and how we’re feeling. When we’re more active – emotional or stressed – they increase, falling when we slow down or relax. During the evening, particularly as it starts to get dark, the circadian rhythms kick in again to slow the body down in preparation for bed and sleep. This means that any blood pressure reading will vary depending on the time of day it’s taken and how active or emotional /stressed you are at the time. It’s the reason why it’s important to always take the blood pressure at the same time of day, ideally first thing in the morning when you’re more likely to be relaxed. Emotions play a huge part in blood pressure, particularly those we bottle up (!) and stress of all kinds. These may be one off incidents or ongoing ones. The latter is easy to overlook as it becomes part of our day to day lives – “it’s how things are” – and so we don’t notice the effect it’s really having on us. There is also the well known “White Coat Syndrome” which anyone who’s had their blood pressure checked at their local surgery or hospital will know all about (!). Just the mention of it is enough to send anyone’s blood pressure soaring and that’s without sitting in the waiting room beforehand. This is why it’s important that the person taking your blood pressure sits you down and has a chat with you BEFORE taking your blood pressure AND takes it at least twice, a few minutes apart. If it is a little raised then you should be asked to go back for another reading a few weeks later BEFORE any diagnosis is made and any action / intervention is considered. You should also be asked about what’s going on in your life to see if there are any other issues that need to be taken into account. Often it’s the circumstances that are responsible for the reading rather than anything else. Of course there are cases when the blood pressure is dangerously high and immediate action is needed but these are few and far between. Then there are physical risk factors. Smoking, which includes e cigarettes that are not the “healthy” option many would like to think. Poor diet, particularly one high in processed foods or salt which leads on to another risk factor, being overweight or obese. A lack of exercise also plays a part as it affects the fitness and function of the entire muscular system, including the Heart and blood vessels. Finally, an often overlooked cause is dehydration (!) which makes sense when you remember that a major constituent of blood is water. Why is there concern about blood pressure? Quite simply because it’s seen as a risk factor for many other health conditions. These include Heart Attacks, Strokes and Aneurysms as well as Dementia, Alzheimer’s, Eye problems and Sexual Dysfunction. More generally, it puts additional pressure on the organs, particularly the Kidneys and Liver as well as the Brain. • ACE inhibitors, angiotensin 2 receptor blockers and calcium channel blockers to help dilate the blood vessels. • Diuretics to help flush salt out of the body, which also helps dilate the blood vessels. Advice may also be given on diet, lifestyle, giving up smoking and exercise. There are no prizes for guessing that it’s all down to a little common sense. Cleaning up your diet and making sure you drink plenty of water – while cutting down on caffeine and alcohol – may sound overly simple, but they do make a huge difference. And this is to overall health levels, not just blood pressure. Similarly, taking regular exercise – and one that you enjoy – improves overall fitness levels and helps shift any excess weight. It also helps to burn up excess adrenaline, as well as releasing “feel good” endorphins. Quitting – or at least cutting down on – smoking, is also important and brings big paybacks to overall health levels. Poor sleep or broken nights can affect blood pressure as well as the ability to cope with whatever happens in your life. A “power nap” during the day can act as short term top up and help you to cope with things better. Becoming aware of emotional issues, whether one off or ongoing is also important. Often just acknowledging that they are there can reduce their impact significantly, particularly if they are ones that you can’t – or won’t – address at the moment. Simple de stressing techniques like having a quiet – or loud (!) – rant and rave when you’ve got time to yourself or scribbling it all out on newspaper can make a real difference. Mediation, relaxation or talking therapies can all help too. A regular detox is a simple way to cleanse body fluids and the blood. The simplest way to do this is by taking Milk Thistle tincture twice a day for a month. This can then be followed by taking a teaspoon of apple cider vinegar in warm water each morning as part of your routine to help clean and alkalise the body. Crataegus tincture, made from the hawthorn berry, is a traditional approach for high blood pressure being high in Vitamin C as well as helping dilate the blood vessels. It can be safely taken both short or long term. Useful supplements include Vitamins A, C and E, which are all powerful antioxidants, as well CoQ10, fatty acids, magnesium, potassium, garlic, ginger and cayenne pepper. So now we’ve demystified blood pressure – and, hopefully, reduced yours in the process (!) – it’s over the you. It really isn’t the bogeyman that so many think it is, just another reminder about the importance of the things you do at home every day. There are so many things you can do to improve – or maintain – it, all of which help your overall health as well. We know that it sometimes sounds as if our record has got a little stuck (!) but it really is the small things you do every day that make the difference – for good and ill.